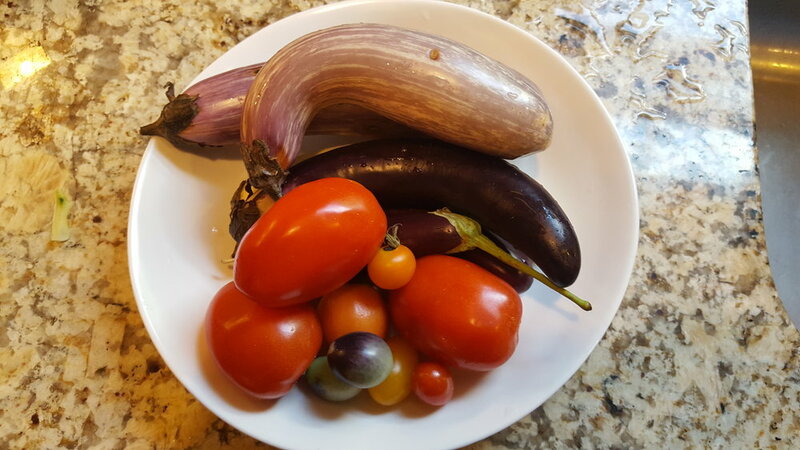 If you are lucky enough to have your own garden, or have access to one, you will have an abundance of both eggplants and tomatoes this time of year. At some point, you will wonder what to do with them. Eggplant parmesan again? That eggplant soup that Sydney mentioned that is delicious but seriously, more work than I am willing to put in right now? Well, rest assured. Here is a simple, easy recipe, that you can make as a decadent, healthy lunch for yourself. When you eat this, you will feel full for a very, very long time. It's the eggplant. Some people describe eggplant as "meaty", in an effort to describe its filling effects on a stomach, I think. But, to me, eggplant is not meaty. Meat is meaty. Eggplant is eggplant. Glad we cleared that up. This recipe is inspired by one I found on Smitten Kitchen. If you don't read that blog, you should. It's the best. The author, Deb Perlman, makes hers on top of slices of globe eggplant, and then serves the tomato bruschetta on top. This is beautiful and delicious - pretty enough for a dinner party appetizer. I made mine as a pile of roasted eggplant just because I had the long, thin Japanese eggplant, which don't make a good individual serving piece. I modified the recipe a bit, just based on what I had on hand. You should feel free to do the same. 2 globe eggplants or 8 long, thin eggplants. Preheat oven to 400 degrees. Slice globe eggplant into 1/2 inch slices, or long eggplants in half, lengthwise. Spray a casserole dish with canola oil, and also the eggplant. Sprinkle with salt and pepper. Place in oven and cook, undisturbed for 20 minutes for globe eggplant and 15 minutes for the long, thin variety. Once toasted on the bottom, flip and cook for an additional 10 minutes, or until browned on both sides. 2. 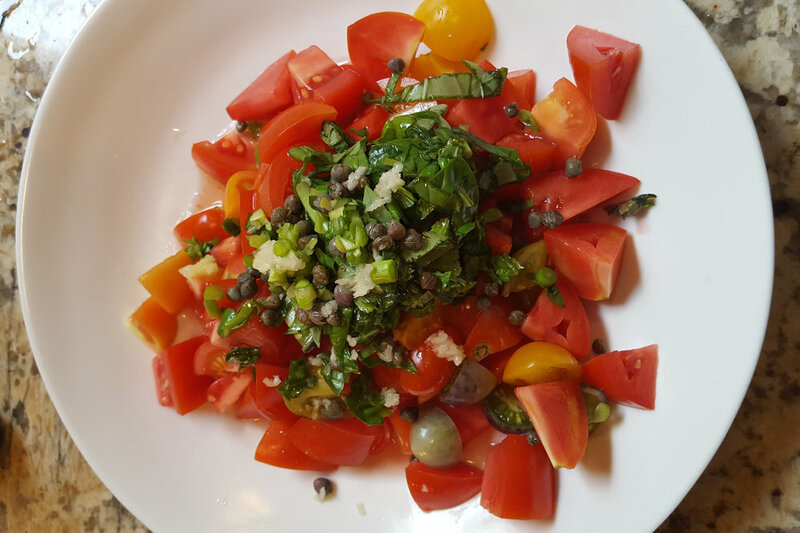 Meanwhile, toss the tomatoes, herbs, capers, scallions, vinegar, and olive oil. Top with feta cheese and stir. 3. 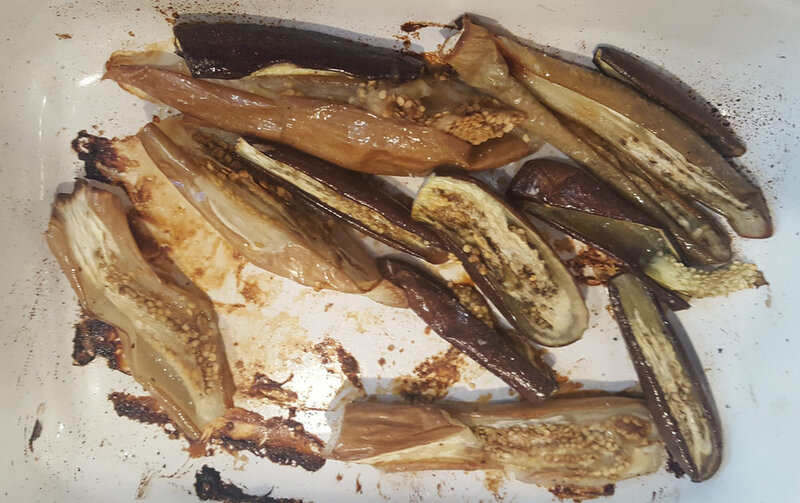 Place roasted eggplant on a plate. Top with tomato mixture. Enjoy!